allround geek: Have a good "tour of duty" mastorak! Have a good "tour of duty" mastorak! Today is a sad day for allround geek. 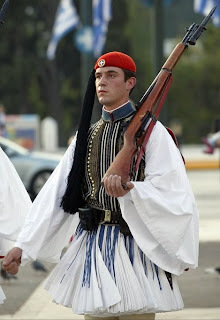 The blog's founder, mastorak, departed today for his mandatory 9 month tour of duty in the Greek army. It is a time during which boys become men. It is also a time when all your earthly possessions are getting plundered by your friends and relatives. As I am writing this post, mastorak is waiting at the airport and already his sister got his car, hotshuk got his PlayStation 3, his cousin got his PlayStation 2 and yours truly is enjoying access to his steam account. Goodbye Kostis, we'll really miss you man! i am on route to the train station from the airport. the taxi driver is kind enough to let me use his 3g enabled netbook.